As part of our progressive values, we educate for democracy at Catlin Gabel. Students participate in their own governance, holding office as class presidents, treasurers, and secretaries, with a vice-president and president of the student body. Our students participate by voting, meeting with their officers, and speaking at public forums through which they attempt to modify and influence our school’s policies and practices. I am often invited by officers and the president (who sits on our board of trustees) to consider schedules, courses, teaching practices, and available opportunities for students. Catlin Gabel students have voice within our community. While students participate in a model of democracy at school, they practice a variety of skills through their coursework. The current exhibit in the Creative Arts Center Gallery about Executive Order 9066 and Japanese internment shows the work of students in American Studies. These eleventh and twelfth graders recently studied why this policy is relevant to our modern nation, how it evolved in its historical context, and how people resisted it. They showcase their learning and invite the rest of our community to participate in dialogue through their exhibit. The audience in the gallery is invited to consider current situations through which minority citizens are marginalized and threatened. They are then invited to respond, posting written notes. To the question of what they could do to avoid a repetition of this type of injustice, students have said “vote,” “VOTE,” “Vote.” This is a clear example of our learners increasing their understanding of complex issues as they prepare themselves to be responsible citizens. Students in Advanced Biology have recently learned the molecular details of CRISPR technology, which allows genetic modification of human embryos (and other cells). In the context of their scientific learning, students reviewed the work of He Jiankui, at the Southern University of Science and Technology in Shenzhen, in order to understand the controversial question of modifying human embryos and fetuses for specific desired outcomes. One of our explicit learning goals for our science students is building the knowledge and skills necessary to be informed, participatory, and engaged voting citizens. We know our graduates will eventually vote on the use of such technologies (perhaps sooner than we imagine) which will define the future of our population and will influence international law. Students understand that the ultimate objective of their learning is taking responsible action, locally and globally. As students embark on a new unit in United States History, during the next few weeks, they will interview immigrants in the larger Portland area. Students will pair their learning of our history, laws, and current policies by an empathetic understanding of people who have chosen or been forced to immigrate to our country. These interviews foster awareness of others and push students to explore different experiences and viewpoints, in different settings, which will serve them well as participants in our democracy. As part of their English curriculum, all upper schoolers practice their written voice and agency through an open-ended assignment that requires them to advocate, in writing, for something they believe in. Many have been surprised by the responses they have received from public officers, representatives of organizations, and business leaders who read their polished work and listen to opinions and requests and, on occasion, act as a result of the work of our students. There are dozens of opportunities that offer upper schoolers the chance to consider different viewpoints, to examine their privilege and power, to think critically about our history and proactively about our present, to find their voice and to use it. We do this in the arts, in mathematics, in assemblies, in modern languages, in our trips (global and in the outdoors), in extracurricular activities, through community engagement. We teach with our mission in mind through a challenging curriculum and toward responsible action. Our curriculum is responsive to the young adults we work with and the demanding environment we live in. I respect and admire the work that our students and teachers do, regularly, to preserve and live our democratic values. 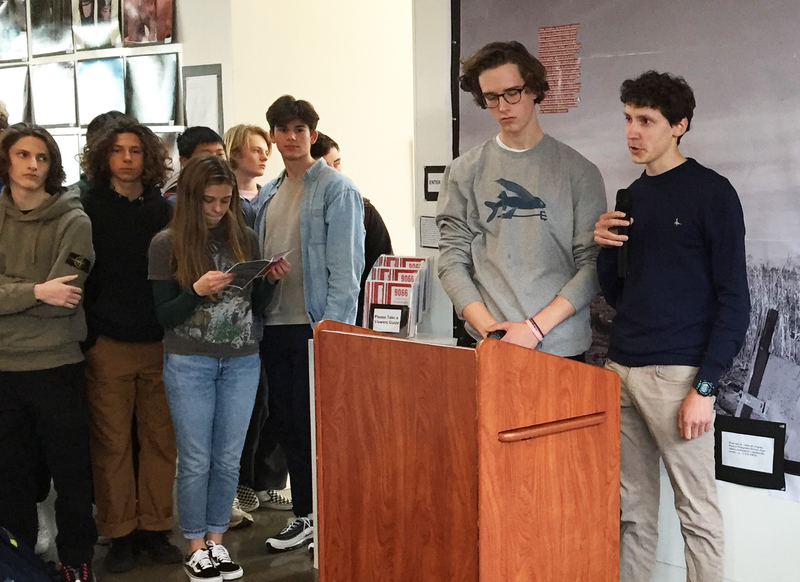 Pictured: Upper School students at the opening of their multimedia, interactive exhibit "9066: A History of Fearmongering." The exhibit invited visitors to make connections between current issues of bigotry and oppression and the World War II-era internment of Japanese Americans.